EAST VILLAGE — A group of local architects planning to transform vacant spaces into quick-hit rentals will launch a prototype space next month in the East Village. 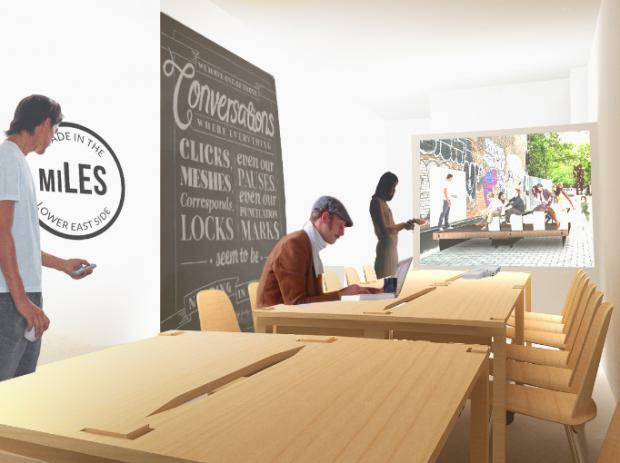 MiLES — Made in the Lower East Side — will be partnering with the East Village nonprofit Fourth Arts Blocks starting April 1 for three months to operate a 300-square-foot storefront at 75 E. Fourth St. as a versatile community space that has the ability to turn from an office for freelancers into pop-up shop in mere moments. The group hopes the small-scale experiment will prove the idea's feasibility of turning numerous vacant lots in the area into rental spaces by the hour or day for community meetings, art exhibitions, pop-up stores or even potluck dinners. "In the next thee months we are trying to validate the business model and the programing," said Eric Ho, 31, from Architecture Commons, one of the six organizations that make up MiLES. "We want to see if it is a sustainable business model and if enough people are interested." Last year, the team from MiLES identitifed more than 200 vacant storefronts or lots in the East Village and Lower East Side. Its concept includes creating an online catalog of those vacant spaces, with the option for community groups, businesses and local residents to rent spaces directly from landlords while there is no long-term tenant. "These are the ideas the community wanted," said Ho, who spent the later part of last year pitching the idea to Community Board 3, locals groups and landlords to better utilize vacant storefronts or lots in the area. As for MiLES’ initial storefront experiment, freelancers interested in a renting one of 12 seats in the collaborative workspace — equipped with features like WiFi, printers and coffee — have different pricing options. They range from $40 per month for 20 hours on a first-come-first-serve basis, to a fully reserved seat from 10 a.m. to 6 p.m. every day of the week for $240. For evening or weekend events, prices vary depending upon the size, purpose and time of the occasion. A weeknight classroom space with 25 seats for two hours runs $40, for instance, and a pop-up shop for an entire weekend day costs $400. Ho is hoping that the popup will show both the community and landlords — who have proved difficult to court with the idea — that MiLES can be a win for both parties. "What we want is MiLES to bring to the neighbor an accessible way for people to use storefronts," he said, "to rent them on their own terms and do their own programing."